We just did our first non-incremental release of the DM1 store analytics platform since we brought it to market. It brings new analytics views to the Workbench, a host of UI and analytic tweaks, new cloud options and, best of all, real-time and full-store playback functionality to the product. Real-time creates a bevy of opportunities to operationalize measurement in both operations and marketing. So DM1 can drive more value, faster. What’s next? At the end of my last post, I described some of the juicier features slated for upcoming release: a real-time, dedicated Store Managers console, full pathing and even some machine learning applications. But I want to step back from a feature list and talk a bit about where we see the DM1 platform headed and how we try to balance and prioritize new functionality as we shape the product. It’s hard to do because we love all the new features. From a personal perspective, no part of building Digital Mortar is more interesting or more intellectually challenging than building DM1. On the one hand, building SaaS systems in the cloud today is incredibly gratifying. You can build powerful, beautiful stuff so much faster and easier than back in the ‘80s when I first started programming or even in the late ‘90s when Semphonic took an abortive shot at building a web analytics tool. But an embarrassment of riches is still an embarrassment. Throwing stuff at a wall doesn’t make for a coherent product road-map. So when we think about new feature prioritization for DM1, we start with our core product vision. DM1 is designed to be the measurement backbone of the store. We see the store as a learning machine with the core methodologies we brought from digital: continuous improvement through test & measure driven by analytics based on behavioral segmentation (what people actually do) and the ability to break-down shopper journeys into discrete, analyzable steps. That core vision shaped our initial DM1 release (what Valley folks love to call the MVP – an acronym that is surely designed to suggest the sporting world’s Most Valuable Player award but actually stands for Minimally Viable Product). When DM1 went live, just about every piece of it was specifically targeted to this core vision. It provided direct access to a bunch of journey metrics that described how the store performed, it included basic shopper segmentation to analyze cross-sell patterns and do simple day-time parting, and it included a pretty robust funnel tool for breaking down shopper journeys into individual (step) components. Let’s call this basic shopper-journey, store measurement system DM1’s core. It’s the engine that drives and integrates every other aspect of what the product might eventually do. Coming out of the digital analytics world, we tend to map a lot of our thinking into that model. The DM1 core is the equivalent of Adobe Analytics in the broader Adobe Marketing Suite. It’s the analytic and measurement engine. Right now, most of our focus will continue to be on building that core engine. New and More Comprehensive Associate Reporting: Track individual and team performance on the floor with optional integration to VoE, employee meta-data, and VoC from in-store visits. DM1 already includes a lot of generalized Associate analytics, but this report will distill that into a set of reports that are much easier to digest, understand and act on. D3 Integration: DM1’s current charting capabilities are pretty basic. We use an off-the-self package and we provide straightforward bar and line charting. Probably the best part of the charting is how seamlessly DM1 picks the best chart types, intelligently maps to separate axes, and lets you easily combined “like indices” in a single chart. But we’re far from pushing the envelope on what we can do visually and by using D3 for our charting package, we’ll be able to considerably expand the range of our visualizations and support even deeper on-chart customization. Full Pathing: We’ve been tinkering since day 1 with ways to bring full pathing to store analytics. On the one hands, it’s not really all that hard. The amount of data is much less than we’re used to in digital. Our engine passes the data exhaustively with every query, so full pathing isn’t going to strain us from a performance perspective. But stores don’t have discrete waypoint like pages on a Website which makes each shopper’s path potentially a snowflake. We’ve tried various strategies to meaningfully aggregate paths within the store and I think we’ll be able to produce something that’s genuinely interesting and useful in the next few months. This will supplement the funnel analytics and provide richer and more varied analysis of how shoppers flow through the store. Segmentation Builder: DM1’s current segmentation capabilities are limited to basic filtering on a set of pre-defined types. It does provide a pretty nice ability to segment on uploaded meta-data, but you can’t build more complex segments using Boolean logic or Regex. Not only do I think that’s important for a lot of analytic purposes, it’s also something we can support fairly easily. Machine Learning for Segmentation: On that same theme, I’m a believer in data-driven segmentation. Data-driven segmentation uses more data, is richer, more reflective of reality, and usually more interesting than rule-based segmentations even if produced in a fairly rich builder. Both GCP and Azure offer pretty amazing ML capabilities that will allow us to build out a good data-driven segmentation capability for DM1. I think the harder part is doing the UI justice. Store Groups: DM1 handles lots of stores, but right now, the store is the ultimate unit of analysis. We don’t support regions or fleet-wide aggregations. There are a lot of analytic and reporting problems that would be solved or made much easier with Store Groups. It’s a capability we’ve considered since Day 1 and sooner rather later I except it to be in the product. Fully Integrated Dashboard: V2 didn’t do much to evolve the dashboard capability of the product, but we have a pretty clear direction in mind. In the next release, I expect the Dashboard to be capable of containing ANY Workbench view. That’s a simple elegant way to let analysts customize the dashboard to their taste and produce exactly what they need for the business. I remember a computer scientist from the original deep-blue chess program saying something to the effect that “Exhaustive search means never having to say your sorry”. No matter how much capability we build out in the dashboard, analysts are always going to want something from the Workbench if it does more. So I think it just makes sense to unify them and let the Dashboard do EVERYTHING the Workbench does. Not everything we have in mind is about the core though. In the next few months, we plan to release a Store Manager Console based on the new real-time capabilities. The Store Manager Console is a whole new companion capability for DM1 targeted to a fundamentally different type of user. DM1 core is for the corporate analyst. It’s a big, powerful enterprise measurement tool. It’s definitely more than most Store Managers could handle. But while the centralized model works really well in digital analytics (since Websites are wholly centralized), it’s less than ideal in the store world. There are a lot of decisions that need to happen locally. DM1’s Store Manager console will continuously monitor the store. It will keep track of shopper patterns, monitor queue times, alert if shoppers aren’t getting the help they need, and make it easy for Store Managers to allocate staff most effectively and message them when plans need to change. It’s a way to bring machine smarts and continuous attention to the Store Managers iPad. Most of the capabilities we’re baking into the Store Manager Console (SMC) were actually delivered in V2. The real-time store tracking, simulator and Webhooks for messaging are the core capabilities we needed to deliver the SMC and were always a part of that larger vision. As I hope our rate of progress has already made clear, we’re ambitious. Software design usually embodies deep trade-offs between functionality and ease-of-use or performance. Those trade-offs are challenging but not inevitable. We’ve seen how digital analytics tools like Google Analytics and data viz tools like Tableau have sometimes been able to step outside existing paradigms to deliver more functionality side-by-side with better usability. Most of what we’ve done so far in DM1 is borrow creatively from two decades worth of increasing maturity in digital analytics. Still, tools like our Funnel Viz and – particularly – our Store Layout Viz have tackled location/store specific problems and genuinely advanced the state-of-the-art. As we tackle pathing and machine learning, I hope to do quite a bit more of that and find ways to bring more advanced analytics to the table even while making DM1 easier to use. Flexible Cloud Hosting: Azure or Google Cloud, your choice. And that’s just the big stuff. There have been a host of small tweaks, fixes, performance enhancements and visual improvements in the intervening months. That initial version of DM1 had a pretty remarkable feature set for a V1 product in a brand new market. It delivered a revolutionary store visualization tool that mapped its powerful metrics into the store at any level of abstraction – from Display to Section to Department to Floor to Store. And the metric set if provided shattered existing door-counting paradigms by delivering real journey metrics. What shoppers did first. Where they spent the most time. Every place they shopped. What got the most consideration. What converted. What didn’t. And DM1 V1 integrated a rich set of Associate tracking metrics into the basic product as well. Associate presence, intra-day STARs, interaction rates and times, and associated lift. DM1 also delivered powerful grid-based reporting and charting, a really cool funnel analytics tool and a powerful side-by-side comparison tool. With the new features, we’ve focused on adding a set of capabilities that extend DM1 deeper into the store and make it easier to integrate into broader store marketing and operations efforts. The biggest part of that is, of course, real-time. We’ve always collected store data in real-time – and all of our collection technologies support near real-time data about the shopper. But in the V1 release, everything we did was batch processing and next-day analytics. That isn’t just because batch processing is easier (though that did matter to us). It was also because many years of experience in digital analytics convinced us that the applications for real-time analytics were fairly rare. There was a time when real-time reporting was a huge part of the digital analytics sales process. But in the end, the dominant tools in digital analytics deliver intra-day but far from real-time analytics. So we figured if a very mature market like digital analytics could do without real-time, we didn’t need it for our V1 release. But the store is different beast than a Website, and we’re finding that having a real-time view of what’s happening makes it possible to add value at the Store Manager level AND support both CRM and queue management applications that help improve the customer experience. So real-time became a central piece of our V2 release. And once we built out the core capability, we took advantage of it in multiple ways. The Realtime view show’s what’s happening right now in the store. Associates and Shoppers are shown (using different symbols) and you can quite literally track exactly where they are and where they are going. We even color-code Shoppers to make it easy to identify how long they’ve been in the store. Pretty cool. The Playback capability provides the same view but processes historical data. Since it’s historical, it can collapse time periods into a time-lapse view. So you can see an hour or a day in five minutes. Being able to see real-time data is cool and highly useful for folks on the ground, but I won’t claim the analytic implications are enormous. What is enormous, though, is the capability to tie DM1’s tracking and measurement into real-time messaging systems. We’ve built a straightforward Webhook messaging interface that lets you get three kinds of data out of DM1: current metric data (for uses like queue length), real-time shopper data, and real-time Associate data. The real-time shopper data can be based off any customer key we have. And it provides a CRM view that includes Entry Time, Total-Time in Store, Presence and Lingers by Section, Current Location, Time since Interaction, and Associate ID of last interaction. You can use this data to generate real-time messages via your mobile application or in-store beacons to the shopper. As cool as this shopper interface is, I’ve long been a believer that messaging Associates is even more fundamental and important. With shoppers, opt-in is always a challenge. And barring a truly compelling application, I think it’s tough to get enough opt-ins for messaging to make it impactful. But Associates are increasingly being armed with digital tools that allow them to do more (like distributed PoS) and serve the customer better. Being able to optimize Associate interactions with real-time data and positioning is a huge leap forward in operational sophistication. In addition to real-time, we’ve made a boatload of analytic enhancements too. And one of my favorite new views is the WeekTime report. We’d already build a custom report around staffing that laid out STARs (Shopper to Associate Ratio) by day of week and time of day (down to the hour). But that report wasn’t a thing of beauty and, in any case, it was specific to the STARs metric. 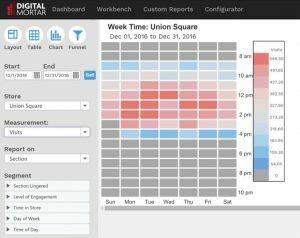 Because Day-time parting is so fundamental to the store, we wanted a generalized analytics tool that would do the job. 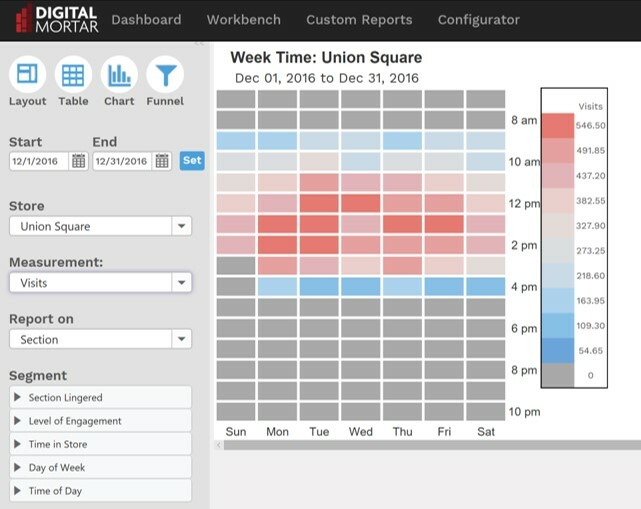 The WeekTime tool lays out any metric by day-of-week and time-of-day. Here are some examples of the WeekTime tool. The first view shows when the store had the most shoppers. The second view shows when shoppers spent the most time in the store. And like all DM1 workbench tools, the Weektime tools is driven by our big data event-level engine so it supports integrated segmentation across any time-period. It’s a really nice analytic addition to the Workbench and the Dashboard view. It makes it much easier to quickly visualize and understand how day-time parts are driving performance on any measurement. One of the biggest changes we made in V2 isn’t functional but environmental. We built DM1 on Azure and it’s been a great platform. But we’ve seen that our clients are going in all sorts of directions in an incredibly competitive cloud marketplace. And if the rest of your infrastructure is on Google Cloud (GCP), then it just makes sense that DM1 live there too. So in V2, we offer the choice of cloud provider. We’ve ported the entire platform into GCP and – as a bonus gift to ourselves – made the deployment process a lot more automated and easier for us. Microsoft Azure or Google GCP – it’s now your choice. And it’s just part of making sure DM1 is the most technologically sophisticated AND seamless platform around. V2 is another big step for us. But we’re just getting started. I keep an ever-growing Trello board of new features and some of the most exciting stuff to come includes a full real-time Store Manager tool, a much more comprehensive and beautiful Associate performance report, a store-change report that automatically shows you the impact of every store change in a period of time, the integration of D3 into our charting capability, a full pathing tool, a robust segmentation builder, and even an initial foray into machine learning. My last post made the case that investing in store measurement and location analytics is a good move from a career perspective. The reward? Becoming a leader in a discipline that’s poised to grow dramatically. The risk? Ending up with a skill set that isn’t much in demand. For most people, though, risk/reward is only part of the equation. There are people who will expend the years and the effort to become a lawyer even without liking the law – simply on the basis of its economic return. I’m not a fan of that kind of thinking. To me, it undervalues human time and overvalues the impact of incremental prosperity. So my last and most important argument was simple: in-store measurement and location analytics is fun and interesting. But there’s not a ton of ways you can figure out if in-store measurement is your cup of tea are there? So I put together another video using our DM1 platform that’s designed to give folks a quick introduction to basic in-store measurement. It’s a straightforward, short (3 minute) introduction to basic concepts in store-tracking with DM1 – using just the Store Layout tool. 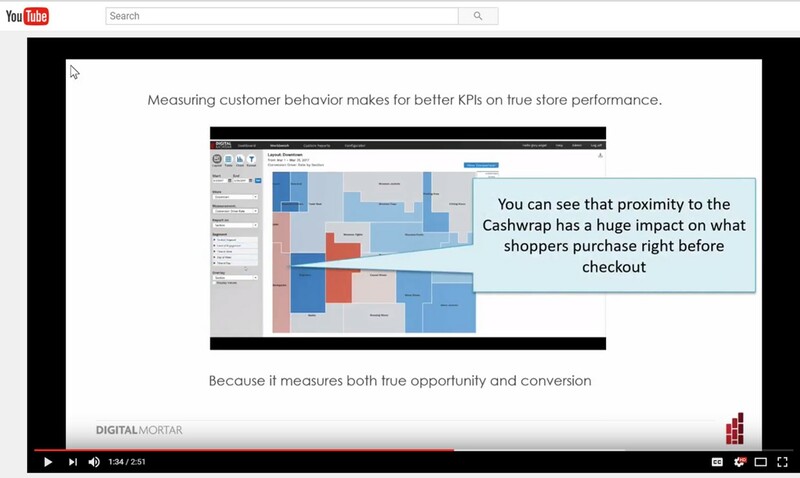 The video walks through three core tasks for in-store measurement: understanding what customer’s do in-store, evaluating how well the store itself performed, and drilling into at least one aspect of performance drivers with a look at Associate interactions. The next section focuses on measures of store efficiency and conversion. It shows how you can track basic conversion metrics, analyze how proximity to the cash-wrap drives impulse conversion, and analyze unsuccessful visits in terms of exit and bounce points. Going from what to why is probably the hardest task in behavioral analytics. And in the 3rd section, I do a quick dive into a set of Associate metrics to show how they can help that journey along. Understanding where associates ARE relative to shoppers (this is where the geo-spatial element is critical), when and where Associates create lift, and whether your deployment of Associates is optimized for creating lift can be a powerful part of explaining shopper success. The whole video is super-quick (just 3 minutes in total) and unlike most of what I’ve done in the past, it doesn’t require audio. There’s a brief audio introduction (about 15 seconds) but for the rest, the screen annotations should give you a pretty good sense of what’s going on if you prefer to view videos in quiet mode. I know you’re not going to learn in-store measurement in 3 minutes. And this is just a tiny fraction of the analytic capability in a product like DM1. It’s more of an amuse bouche – a little taste – to see if you find something enjoyable and interesting. I’m going to be working through a series of videos intended to serve that purpose (and also provide instructional content for new DM1 users). As part of that, I’m working on a broader overview right now that will show-off more of the tools available. Then I’m going to work on building a library of instructional vids for each part of DM1 – from configuring a store to creating and using metadata (like store events) to a deep-dive into funnel-analytics. I’d love to hear what you think about this initial effort! Over the nearly two decades I spent in digital analytics, I did a lot of selling. More than I ever wanted to. But during that time, I saw the process of selling digital analytics transformed. When I started, way back in the ‘90s, selling web analytics was evangelical. I had to convince potential clients that the Web mattered. Then I had to convince them that analytics mattered to the Web. If I got that far, I just to convince them that I was the right person to buy analytics from. But since there were only about five other people in the world doing it, that last part wasn’t so hard! Over time, that changed. By 2005, most companies didn’t need to be convinced that the Web mattered. The role of analytics? That was still a hard sell. But by around 2012, selling digital analytics was no longer evangelical. Everyone accepted that analytics was a necessary part of digital. The only question, really, was how they would provision it. I didn’t miss the evangelical sell. It’s a hard path. Most people are inherently conservative. Doing new stuff is risky. Most organizations are pretty poor at rewarding risk-taking. It’s great to suggest that analytics is powerful. That it will do the organization good. But for someone to take a risk on a new technology and process, there needs to be real upside. Think of it this way – just as VC’s expect out-sized returns when they invest hard-cash in risky startups, so do decision-makers who are willing to go outside the well-trodden path. Well, with Digital Mortar, I’m right back in the evangelical world. I have to sell people on the value of in-store customer measurement and analytics – and often I have to do it within environments that are significantly disrupted and challenged. So here’s the question I ask myself – what’s in it for an influencer or a decision-maker? I think that’s a surprisingly important question and one that doesn’t often get asked (or answered). 1. Is there a future career in this stuff? There was a time when understanding how to create digital analytics tags was a really critical skill. That day has passed. Tagging is now a commodity skill often handled by offshore teams. In technology and analytics, in-demand skills come and go. And it’s critically important to keep building new skills. But which skills? Because there’s always lots of possible choices and most of them won’t end up being very important. It’s pretty obvious that I believe location analytics has a big future or else I wouldn’t have started Digital Mortar. Here’s why I think this stuff matters. I saw how compelling analytics became in the digital world. With increasing competition and interaction between digital and physical experiences, it’s just implausible to believe that we’ll continue in a world where online experiences are deeply quantified and physical experiences are a complete mystery. Every digital trend around customer centricity, experimentation and analytics is in-play in the physical world too – and all of them drive to the need for location analytics. The thing is, measurement creates its own demand. Because once people understand that you can measure something, they WANT to know. 2. Is there a real benefit to being an early adopter? The people who got into digital analytics early carved out pretty admirable careers. Sure, they were a smart group, but in a new analytics domain, there is a real premium to early adoption. When that field starts to get traction, who gets to speak at Conferences? Who gets to write the books? It’s the early adopters. And if you’re the one speaking at conferences or writing the books, you get real opportunities to build a unique career. Being an early adopter of a technology that pans out is a huge win for your personal brand. It almost guarantees a set of terrific career options: leading a consultancy, having a cush job as an evangelist at a place like Google, getting recruited by a technology unicorn, or managing a large group at a premium company. All good stuff. And by the way, it’s worth pointing out that this type of measurement isn’t limited to retail. You think resorts, arenas, and complex public spaces don’t need to understand the customer experience in their spaces? Location analytics won’t be in every industry. But it will be every WHERE. But none of that stuff will happen unless you have some success. 3. Can I be successful right now? How much success you need is easily exaggerated. Early adopters (and this is a good thing) are like fisherman. We mostly know how to tell a good story. But getting real success IS important. And fortunately, location analytics systems are good enough to do interesting measurement. The capture technologies have plenty of issues, but they work. And a platform like DM1 lets you do A LOT with the data. Best of all, if you’re already experienced with digital analytics, you know a bunch of what’s important about dealing with this data. That makes early adoption a little less frightening and a lot more likely to be successful. There are real use-cases for this technology. Use-cases that have been hidden by the generally awful analytics capabilities of previously existing systems. This kind of measurement can identify and help solve line and queue management problems, answer questions around store and location design, resolve issues around staffing and associate optimization and feed better forecasting and allocation models, and drive powerful enhancements to customer CRM and personalization efforts. 4. How risky is it? Middling. This stuff is still pretty new. But it’s starting to mature rapidly. The technology is getting better, the analytics software just got MUCH better, and the needs just keep growing. As with most analytics – the hard part is really organizational. Getting budget, getting authority, driving change – those are always the hardest tasks no matter how challenging things are on the data collection and analytics front. But no one’s ever seen this kind of data before. So the bar is incredibly low. When people have spent years living with hunch, intuition and door-counting as their sole metrics, you don’t have to provide world-beating analytics to look like a star. 5. Is it interesting (because no one wants to spend their life doing boring stuff)? Yep. This stuff is deeply fascinating. Customer experience has long been one of the most interesting areas in analytics. People are great to study because their behavior is always complex. That makes the analytics a challenge. And because its people and behavior and the real-world, the problem set keeps morphing and changing. You’re not stuck analyzing the same thing for the next ten years. Even better, identifying problematic customer behaviors is the table-set for actual business change. Once you’ve found a problem, you have to find a way to fix it. So the analytics drives directly into thinking about the business. I like that a lot. It means there’s a purpose to the measurement and the opportunity to brainstorm and design solutions not just analyze problems. If you enjoy doing digital analytics (or have always thought you might), this is an even richer and more complex set of analytic problems. Which brings me to the bottom line. Risk is risk. A lot of businesses fail. A lot of technologies don’t take off. But I’m pretty confident that in-store journey measurement and location analytics will become a significant discipline in the next few years. If I’m right, there will be real dividends to being an early adopter. Both for the companies that do it and the people who drive it. And along the way there’s some fascinating analytics to be had and a whole bunch of really interesting stuff to learn. That doesn’t seem like such a bad deal. Continuous Improvement through testing is a simple idea. That’s no surprise. The simplest, most obvious ideas are often the most powerful. And testing is a powerful idea. An idea that forms and shapes the way digital is done by the companies that do it best. And those same companies have changed the world we live in. If testing and continuous improvement is a process, analytics is the driver of that process; and as any good driver knows, the more powerful the vehicle, the more careful you have to be as a driver. Testing analytics seems so easy. You run a test, you measure which worked better. You choose the winner. It’s like reading the scoreboard at a football game. It doesn’t take a lot of brains to figure out who’s ahead. Except it’s usually not that easy. Sporting events just are decided by the score. Games have rules and a single goal. Life and business mostly don’t. What makes measuring tests surprising tricky is that you rarely have a single unequivocal measure of success. Suppose you add a merchandising drive to a section of your store or on the product detail page of your website. You test. And you generate more sales of that product. Let’s start with the obvious caveat. You may have generated more sales, but you gave up margin. Was it worth it? Usually, the majority of buyers with a discount would have bought without one. Still, that kind of cannibalization is fairly easy to baseline and measure. Here’s a trickier problem. What else changed? Because when you add a merchandising drive to a product, you don’t just shift that product’s buying pattern. The customer who buys might have bought something else. Maybe something with a better margin. Part of a good experimental design is, indeed, creating a test that limits external impacts. But this isn’t the lab. Limiting the outside impact of a test isn’t easy and you can never be sure you’ve actually succeeded in doing that unless you carefully measure. Worse, the most important tests usually have the most macro-impact. Small creative tests can often be isolated to a single win-loss metric. Sadly, that metric usually doesn’t matter or doesn’t move. If your test actually changes shopper behavior, believe me, there will be macro impacts. It’s usually straightforward to measure the direct results of a store test. It’s often much harder to determine the macro impact. But it’s something you MUST look at. The macro impact can be as or more important than the direct impact. What’s more, it often – I’ll say usually – runs in the opposite direction. So if you fail to measure the macro impact of a store test and you focus only on the obvious outcome, you’ll often pick the wrong result or grossly overstate the impact. Either way, you’re not using your analytics to drive appropriately. Of course, one of the very real challenges you’ll face is that many tools don’t measure the macro impact of tests at all. In the digital world, the vast majority of dedicated testing tools require you to focus on a single KPI and provide absolutely no measurement of macro impacts. They simply assume that the test was completely compartmentalized. That works okay for things like email testing, but it’s flat-out wrong when it comes to testing store or website changes. If your experiment worked well enough to change a shopper’s behavior and got them to buy something, the chances are quite good that it changed more than just that behavior. You may have given up margin. You likely lost some sales elsewhere. You almost certainly changed what else in the store or the site the shopper engaged with. That stuff matters. In the store world, most tools don’t measure enough to give you even the immediate win-loss results. To heck with the rest of the story. So it can tempting, when you first have real measurement, to focus on the obvious: which test won. Don’t. In some of my recent posts, I’ve talked about the ways in which DM1 – our store testing and measurement platform – lets you track the full customer journey, segment, funnel and compare. Those capabilities are key to doing test measurement right. They give you the ability to see the immediate impact of a test AND the ways in which a change affected macro customer behavior. You can see an example of how this works (and how important that macro behavior is in store layout) in this DM1 video that focuses on the Comparison capabilities of the tool. It’s the right way to use all that power a store testing program can provide. Continuous improvement is what drives the digital world. Whether applied as a specific methodology or simply present as a fundamental part of the background against which we do business, the discipline of change and measure is a fundamental part of the digital environment. A key part of our mission at Digital Mortar is simply this: to take that discipline of continuous improvement via change and measurement and bring it to stores. Every part of DM1 – from store visualizations to segmentation to funnel analytics – is there to help measure and illuminate the in-store customer journey. You can’t build an effective strategy or process for continuous improvement without having that basic measurement environment. It provides the context that let’s decision-makers talk intelligently about what’s working, what isn’t and what change might accomplish. But as I pointed out in my last post, some analytic techniques are particularly useful for the role they play in shaping strategy and action. Funnel Analysis, I argued, is particularly good at focusing optimization efforts and making them easily measurable. Funnels help shape decisions about what to change. Equally important, they provide clear guidance about what to measure to judge the success of that change. After all, if you made a change to improve the funnel, you’re going to measure the impact of the change using that same funnel. One of the biggest mistakes in enterprise measurement (and – surprisingly – even in broader scientific contexts) is failing to commit to your measurement of success when you start an experiment. It turns out that you can nearly always find some measure that improved after an experiment. It just may not be the right measure. If folks are looking for a way to prove success, they’ll surely find it. Since we expect our clients to use DM1 to drive store testing, we’ve tried to make it easy on both ends of the process. Tools like funnel analysis help analysts find and target areas for improvement. At the other end of the process, analysts need to be able to easily see whether changes actually generated improvement. This isn’t just for experimentation. As an analyst, I find that one of the most common tasks I have do is compare numbers. By store. By page. By time-period. By customer segment. Comparison provides basic measurement of change and context on that change. Which makes comparison the core capability necessary for analyzing store tests but also applicable to many analytics exercises. Though comparison is a fundamental part of the analytic process, it’s surprising how often it’s poorly supported in bespoke analytics tools. It took many years for tools like Adobe’s Workspace to evolve – providing comprehensive comparison capabilities. Until quite recently in digital analytics, you had to export reports to Excel if you wanted to lay key digital analytic data points from different reports side-by-side. DM1’s Comparison tool is simple. It’s not a completely flexible canvas for analysis. It just takes any analytic view DM1 provides and allows you to use it in a side-by-side comparison. Simple. But it turns out to be quite powerful in practice. The ability to do this kind of comparison in the context of the visualizations is unusual AND powerful. The Comparison tool isn’t the only part of DM1 that supports comparison and contextualization. The Dashboard capability is surprisingly flexible and allows the analyst to put all sorts of different views side by side. And, of course, standard reporting tools like Charts and Table provide significant ways to do comparisons. But particularly when you want to use bespoke visualizations like Funnels and DM1’s store visualizations, having the ability to lay them side by side and quickly adjust metrics and view parameters is extraordinarily useful. If you want to create a process of continuous improvement in the store, having measurement is THE essential component. Measurement that can help you identify and drive potential store testing opportunities. And measurement that can make understanding the real-world impact of change in all its complexity. Click here to sign-up for a Demo of DM1. Location analytics isn’t really about where the shopper was. After all, a stream of X,Y coordinates doesn’t tell us much about the shopper. The interesting fact is what was there – in the store – where the shopper was. To answer most questions about the shopper’s experience (what they were interested in, what they might have bought but didn’t, whether they had sales help or not, and what they passed but didn’t consider), we have to understand the store. In my last post, I explained why the most common method of mapping behavior to the store – heatmaps – doesn’t work very well. Today, I’m going to tackle how DM1 does it differently and (in my humble opinion) much better. Designing DM1’s store visualization, I started with the idea that its core function is to represent how an area of the store is performing. Not a point. An area. That’s an important distinction. Heatmaps function rather like a camera exposure. There’s an area down there somewhere of course – but it’s only at the tiny level of the pixel. That’s great for a photograph where the smaller the pixel the better, but analytically those points are too small to be useful. Besides, store measurement isn’t like taking a picture. The smaller the pixel the more accurate the photo. But our measurement capture systems aren’t accurate enough to pinpoint a specific location in the store. Instead, they generate a location with a circle of error that, depending on the system being used, can actually be quite large. It doesn’t make a lot of sense to pretend that measurement is happening at a pixel location when the circle of error on the measurement is 5 feet across! Units occupied grid spaces and their movement was controlled by grid spaces. The grid became the key to the game – with the map providing the underlying visual metaphor. This grid overlay is obviously artificial. Today’s first person shooter games don’t need or use anything like it, but strategy games like Civ still do. Why? Because it’s a great way to quantize spatial information about things like how far a unit can move or shoot, the distance to the enemy, the direction of an attack, the density of units in a space and much, much more. And here’s where it really gets powerful. Because not only can you now map every measurement ping to a quantifiable grid space, you can attach store meta-data to the grid space in a deterministic and highly maintainable way. If we have a database that describes GridPoint P14 as being part of Customer Service on a given day, then we know exactly what a shopper saw there. Even better, by mapping actual traffic and store meta-data to grid-points, we can reliably track and trend those metrics over time. No matter how the shape or even location of a store area changes, our trends and metrics will be accurate. So if grid-point P14 is changed from Customer Service to Laptop Displays, we can still trend Customer Service traffic accurately – before, after and across the change. It takes only a glance to instantly see which Sections perform better and which worse at each store. That’s a powerful viz! In DM1, pretty much ANY metric can be mapped on the store at ANY meta-data level. You can see visits, lingers, linger rate, avg. time, attributed conversions, exits, bounces, Associate interactions, STARs ratio, Interaction Success Rate and so much more (almost fifty metrics) – mapped to any logical level of the store; from macro-levels like Department or Floor all the way down the smallest unit of measurement your collection system can support. Best of all, you define those levels. They aren’t fixed. They’re entirely custom to the way you want to map, measure and optimize your stores. And because DM1 keeps an historical database of the layouts and meta-data over time, it provides simple, accurate and easily intelligible trending over time. DM1’s store visualization is one powerful analytic hammer. But as good as they are, this type of store visualization doesn’t solve every problem. In my next post, I’ll show how DM1 uses another powerful visual paradigm for mapping and understanding the in-store funnel!